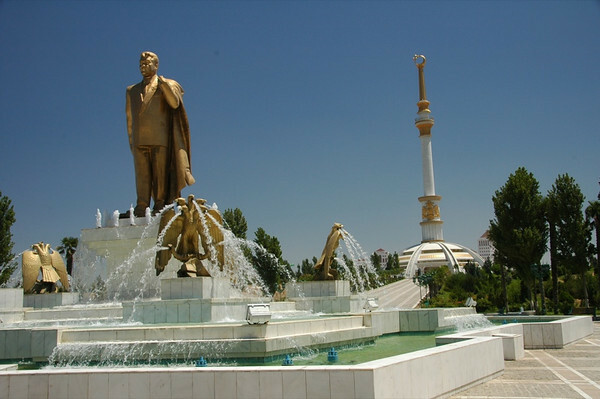 Ashgabat, Turkmenistan travel highlights, including people, food and sights. Just try and figure this place out...we dare you. Read more about our visit to Turkmenistan and impressions of Ashgabat. 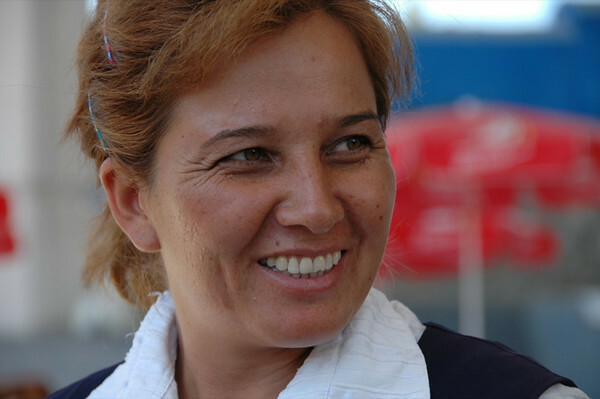 This woman, a teacher from Mary, visited Ashgabat for the weekend with her family. She made sure to visit the Walk of Health, although only got to the first resting point. "Too hot." We were told by someone that the locals call it "Walk of Sickness." There are many sick days called in after all the government employees (including teachers) are required to walk it once a year. It's just too hot. Read more about our visit to Turkmenistan and impressions of Ashgabat. Who knew that Lenin was a bird lover? 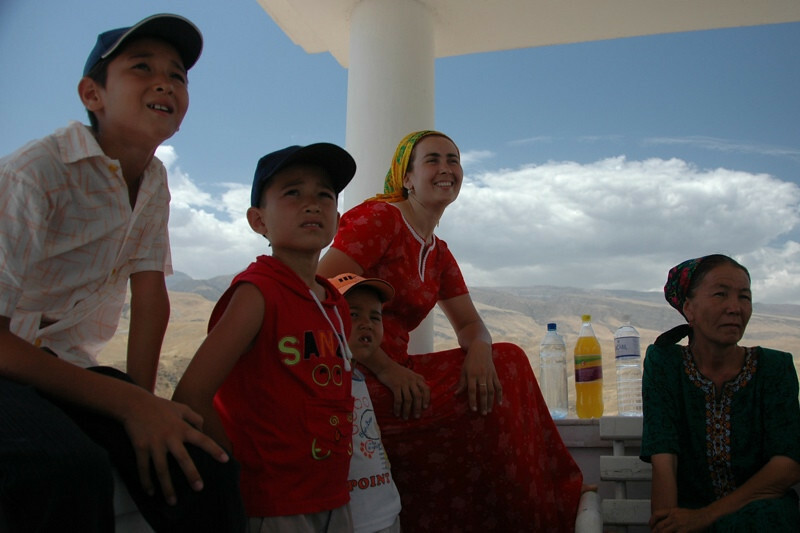 Read more about our visit to Turkmenistan and impressions of Ashgabat. A young couple ties the knot in Ashgabat and has a photo shoot at Ashgabat's Walk of Health...It's tradition for the bride to keep her mouth shut during the day. Biting on fabric usually seems to do the trick. This laden bride is decorated from head to toe in metal and stone jewelry. Read more about our visit to Turkmenistan and impressions of Ashgabat. 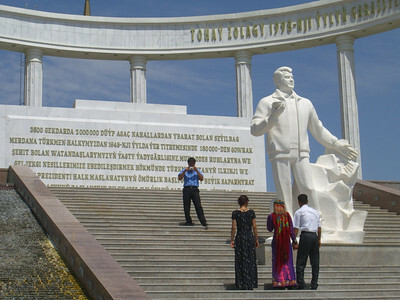 These newlyweds are greeted by a sporty Turkmenbashi statue at the Walk of Health in Ashgabat. Read more about our visit to Turkmenistan and impressions of Ashgabat. 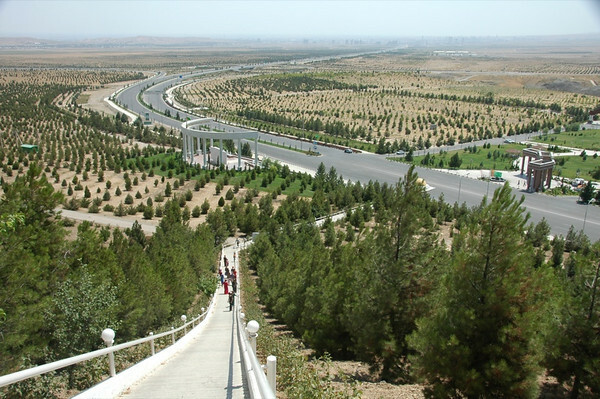 Turkmenbashi instigated a green program before he died, requiring trees to be planted all around the Walk of Health. The idea is that in 10-15 years, these trees will have grown up to create a forest to cool the climate of Ashgabat. That is, if they don't run out of water first trying to irrigate all these trees.... Read more about our visit to Turkmenistan and impressions of Ashgabat. 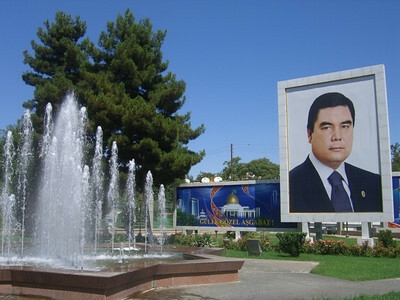 Most of the Turkmenbashi portraits adorning the streets of Ashgabat have been replaced by photos of the new president, Gurbanguly Berdymukhammedov, who bears a confusing likeness to his predecessor. Read more about our visit to Turkmenistan and impressions of Ashgabat. Normally, no one is permitted to take photos of this building, the Turkmen White House. But Audrey smiled nicely and asked a young guard who agreed to allow us to photograph it. ..Atop the Arch of Neutrality, the rules change. No photography. No consistency in photography policy, either. Read more about our visit to Turkmenistan and impressions of Ashgabat. The little golden boy of the Earthquake Memorial looks out on the gold dome of Turkmenbashi's palace. Read more about our visit to Turkmenistan and impressions of Ashgabat. Turkmenbashi (rather, his 12 meter-high gold likeness) greets the sun on top of the Arch of Neutrality and revolves throughout the day to follow the sun. Prior to our arrival, we'd had high expectations of this statue. In reality, it's a tad underwhelming. Outrageous nonetheless. 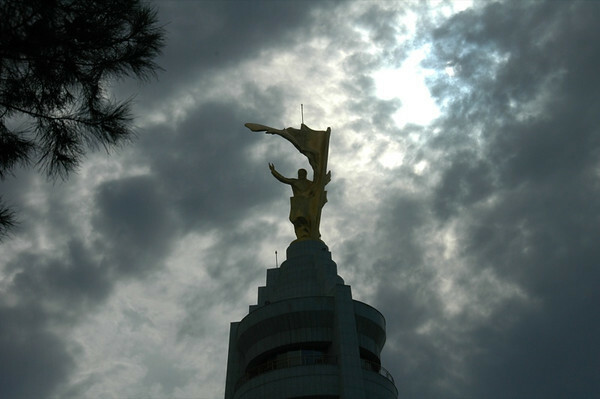 Read more about our visit to Turkmenistan and impressions of Ashgabat. 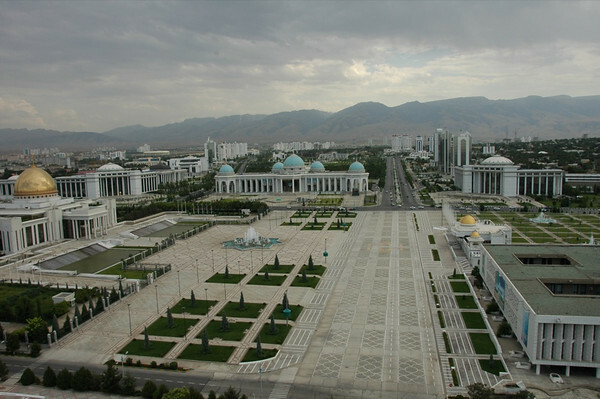 The French construction company, Bouygues Construction, was Turkmenbashi's favorite builder and were contracted to build the government buildings on Independence Square. 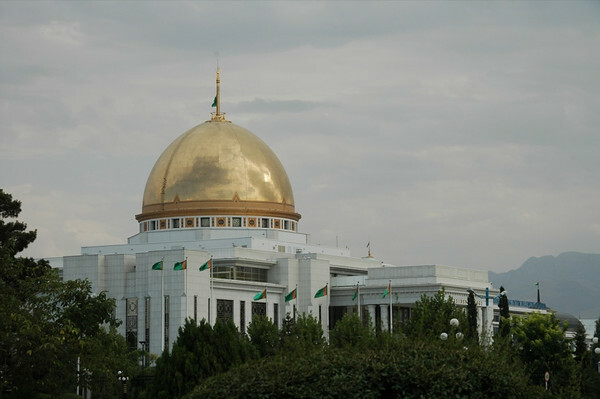 Read more about our visit to Turkmenistan and impressions of Ashgabat. Dave and Dan pose in front of their favorite evening reading, the Ruhnama. 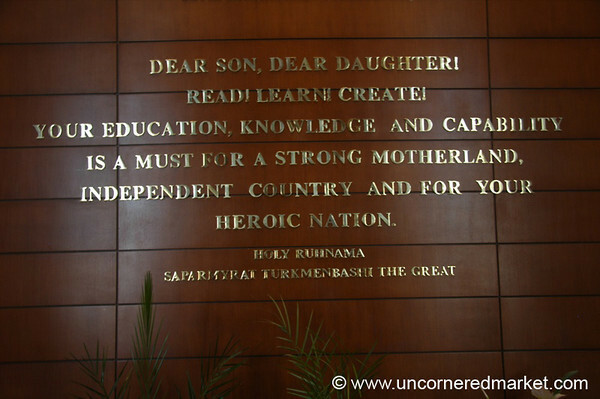 This larger than life copy is in Independence Park in the new suburb of Berzengi. 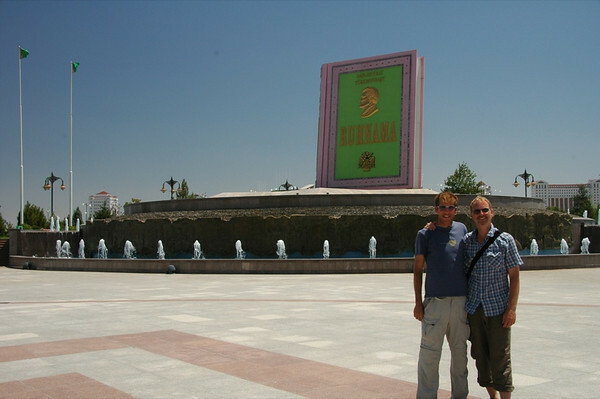 We had heard that the book opens up on special occasion and shows clips of Turkmenbashi on embedded TV screens inside. Unfortunately, we missed the show. Read more about our visit to Turkmenistan and impressions of Ashgabat. 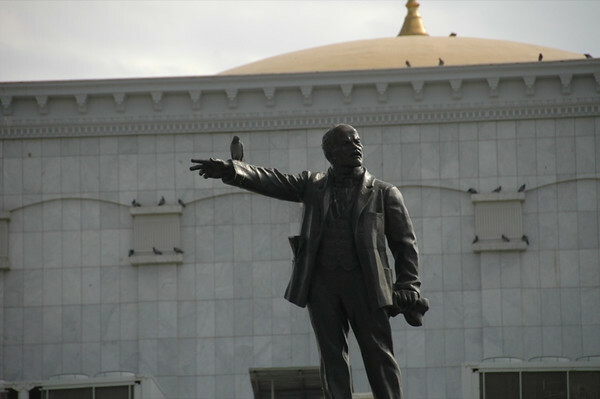 The first president of Turkmenistan, known as Turkmenbashi (leader of all Turkmens) stands proud in front of the Independence Monument in Ashgabat. Read more about our visit to Turkmenistan and impressions of Ashgabat. 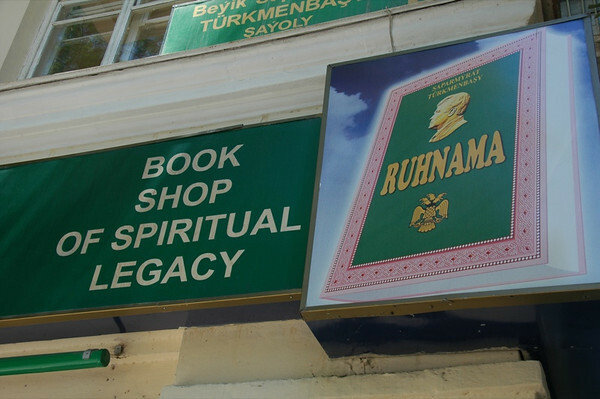 Quotes from the Rukhnama, Turkmenistan's holy book, are everywhere in Turkmenistan. ..It's rare to find a quote in English though. The entrance to the National Library has one...but the library attendants don't like you to photograph it. Read more about our visit to Turkmenistan and impressions of Ashgabat. It is possible to buy the Rukhnama, Turkmenistan's holy book written by its first president, in languages from Japanese to Spanish. This shop was THE place for all Turkmen printed propaganda - from posters of Turkmenistan's best dog breeds to illustrated (and translated) versions of Turkmenbashi's original poetry...In addition to creating a common history and identity, much of the propaganda attempts to provide guidelines for a productive society. Read more about our visit to Turkmenistan and impressions of Ashgabat. 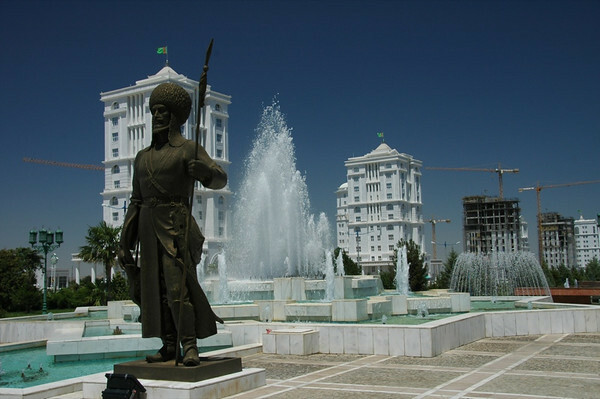 A statue of a traditional Turkmen fighter seems to stand guard in front of the fountains and new buildings of Berzengi neighborhood...Whereas the French build the government buildings, most of these were built by Turkish companies. The Italian white marble tiles (all the same official size) reflect the sun and create the image of Ashgabat as the "white city." Read more about our visit to Turkmenistan and impressions of Ashgabat. 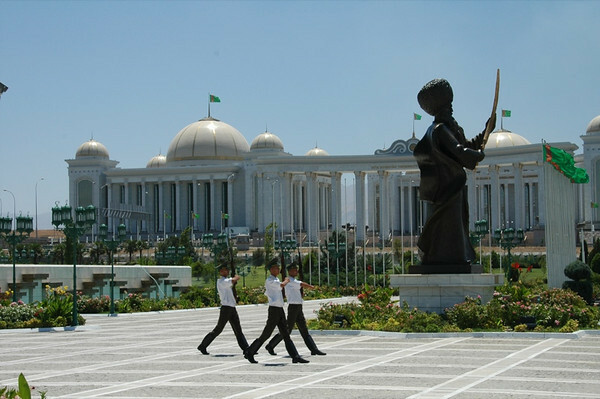 These young recruits squeeze in some marching practice at the the Monument to the Independence of Turkmenistan. 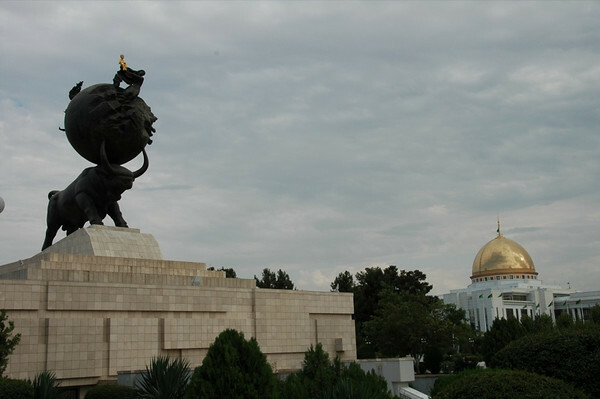 ..The monument is surrounded by statues representing Turkmenistan's history. The National Library and museum are in the background. Read more about our visit to Turkmenistan and impressions of Ashgabat. 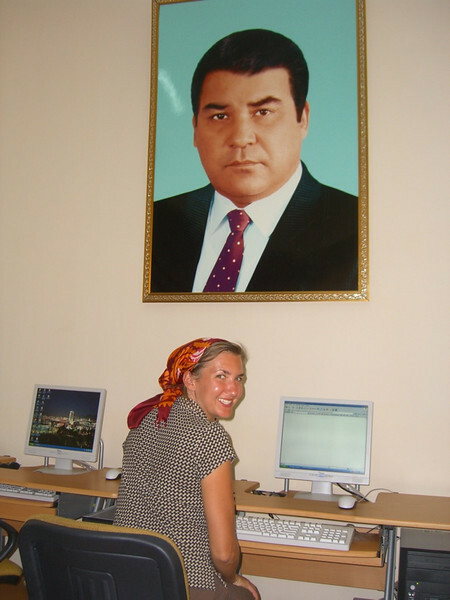 A young Turkmenbashi (now supposedly deceased) watches over as Audrey checks her email at an internet cafe in Ashgabat. We were told that this was almost impossible six months ago, so there is some progress. Showing your passport is still required though to use the internet. Read more about our visit to Turkmenistan and impressions of Ashgabat. 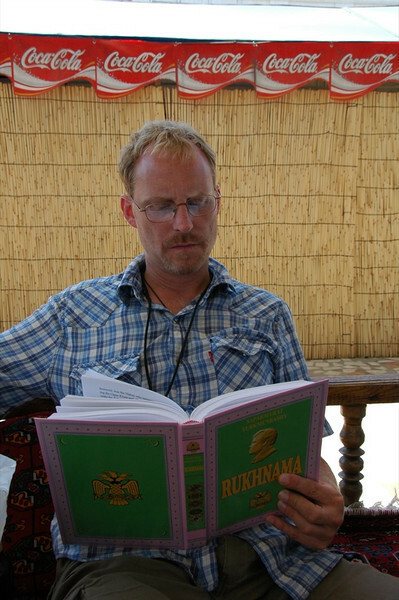 Dave takes in lessons from the Ruhnama. Read more about our visit to Turkmenistan and impressions of Ashgabat. Our waitress at the Gulustan Restaurant in the Russian Bazaar. Read more about our visit to Turkmenistan and impressions of Ashgabat. 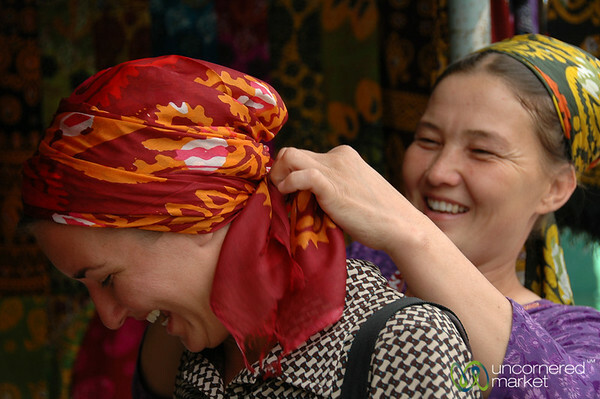 Audrey gets a lesson in tying head scarves at Ashgabat's Tolkuchka market. Audrey took a vote from the nearby vendors on which color suited her best and this scarf won. She became a big hit in the market. Read more about our visit to Turkmenistan and impressions of Ashgabat.